Be Brave…Cut up those panels. This is my favorite of all the panels that I have cut up so far.. Being born in Quebec, I call this one “Quebec’s Backyard” it really reminds me of fall down east. This quilt was ment to be a lap quilt for my husband, after entering it into my 1st quilt show in 2014 and it won a ribbon for best use of orange and also tied for 1st for viewers choice it now resides on the wall in the bedroom. 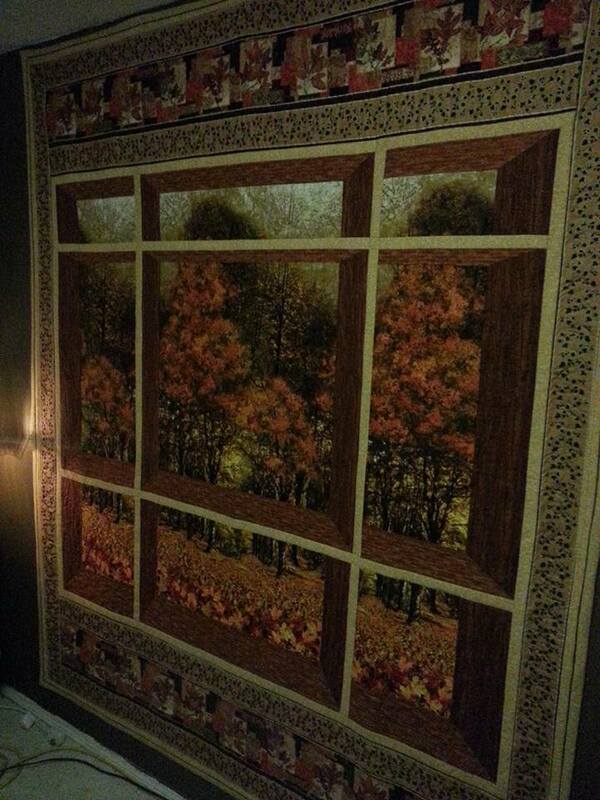 About 3 years ago I purchased a panel that I wanted to turn into a fall runner for my dinning room table. I’m not keen on leaving things the way they are so decided to cut it up and rebuild it on a horizontal setting to make my harvest runner. This is The panel that I used. 2 years after making this runner I found an other panel and it also was cut up to make an other horizontal runner. Here’s a Halloween Panel, I made a small runner and a place mat from this one. I have an aunt that gave me a nativity panel and it also got cut up to make a lap quilt that I gave back to her for Christmas. I took the starts in the corners and built up starts to make my corner blocks. I echoed the diamonds that was found int the printed border of the panel to make this lovely lap quilt. I also ended up with a snowman panel from my aunt also. this one i cut each shape that i wanted to keep and added window panes to make all the shapes the same then i added shadow box and sashing to make this lap quilt. This one is a Stonehenge panel that I made One block wonder with. This was some pillow blocks of whales with a decorative border strip. This one was stretched over a wood frame and hung in a window to make a cotton stained glass version. I hate curtains and this gives me abit of privacy. I sure hope that this gives you an idea that you can let your imagination fly and go on cut up those panels. Previous Sunday after noon project. I certainly relate to your love of the fall panel. I, too, was born in Quebec and now living in BC, I miss the wonderful fall colors we saw in Quebec. At least living in bc you still have the crystal lakes like Quebec had. we have slews miss those too. Great Post Renee! Thank you!! anytime Adelle. glad you enjoyed. your welcome Marylou. I think that creating is one of the fun parts of the whole quilting process. I’m glad that I was able to insprire you.